MWC 2013 has kicked off and TechRadar is at the show checking out the hottest handsets and tablets. Although the show has been a little light on new phones, we still found some that impressed us. For a complete rundown of all the latest news check out our dedicated MWC 2013 channel. If you'd rather just peruse the highlights, then keep on reading: all the key announcements and hands-ons are below. Acer hasn't exactly blown us away at this year's MWC, but we rather like its Liquid Z2 handset. As reviews editor James Rivington writes in our Hands on: Acer Liquid Z2 review this phone is primarily designed as a first baby step into the world of the smartphone. As such, it comes with some helpful features to make the transition as painless as possible. "We give it a tentative thumbs up," he says (tentatively). Those hybrid-obsessed folk at Asus have turned up at MWC with another tablet that's also a phone and now a phone that's also a tablet. One of these devices is the Asus Padfone Infinity and the other is the Asus Fonepad. Padfone. Fonepad. Fadphone. Where were we? We hear that Asus is now working on a 27-inch gaming monitor that you can hold to your ear to make calls, which will be marketed as the Asus Phonitor. Why is there no tiny, removable MP3 player in the back of the phone? Rubbish! 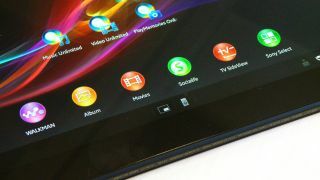 We dispatched TechRadar deputy editor Dan Grabham to the Asus stand to take a look at the Padfone Infinity. Featuring a stunning Full HD display, Dan found the Padfone to be a superb phone and a very capable tablet. Read our full Hands on: Asus Padfone Infinity review for more. Having checked out one phone/tablet thing, Dan then got his hands on another one: the Asus Fonepad, a 7-inch Android 4.1 tablet that can also make calls. "The Fonepad is certainly an interesting device and price point is crucial," he writes in our Hands on: Asus Fonepad review, adding: "It's relatively cheap and will sit above the Nexus 7 yet underneath the iPad mini in Asus' ongoing war with Apple, Samsung and Amazon for the 7-inch tablet space." Ford rolled up at MWC to announce that Spotify is coming to the car dashboard. It'll work with Ford Sync, enabling you to play music wirelessly through your car's stereo system and control it via voice commands. Spotify for Ford Sync has been designed to integrate the two services as seamlessly as possible. So there is no separate app, and nothing you need to install on your phone other than the regular Spotify Mobile app. For more, check out First look: Spotify in Ford Sync. Fujitsu has joined the Android world with its first Android handset, and we're really rather impressed with it. It's been designed for elderly users and as such it's really easy to use. James Rivington had some time with the phone to write our Hands on: Fujitsu Stylistic S01 review and felt that it could be "the life-changing device you give your elderly relative for Christmas this year." HP seems to be over the whole TouchPad, webOS pain now and it's instead joined the Android gang, bringing the Slate 7, its Android Jelly Bean-powered budget tablet, to the party. Set for an April release, the 7-inch tab features a 1.6GHz dual-core Cortex-A9 processor, a slightly low-resolution 1024 x 600 screen, 1GB RAM and 8GB of built-in storage. So what's HP's Android effort like to use? Dan Grabham got some hands-on time with the device and felt that while it's certainly cheap at $169, and not bad looking, "it isn't a hugely impressive tablet", and it doesn't beat the Nexus 7. Read Dan's early verdict in our Hands on: HP Slate 7 review.